Born 19091,2,3 [about 19084], Oklahoma1,2,3. Fred was apparently adopted.4 The names of his birth parents are not known. Hinshaw, Kent C., head-of-household, age 31, born in Indiana; parents born in Indiana; first married at age 26; rented home; no radio in home; occupation: farmer, general farm; World War I veteran. Hinshaw, Ruby B., wife, age 27, born in Indiana; parents born in Indiana; first married at age 22. Hinshaw, Joyce A., daughter, age 4 years 6 months, born in Oklahoma; parents born in Indiana. Hinshaw, Thomas M., father, age 63, born in Indiana; father born in North Carolina; mother born in Indiana; married; first married at age 23. Hinshaw, Fred, brother, age 21, born in Oklahoma; parents born in Indiana; single; occupation: laborer, farm; not a veteran. 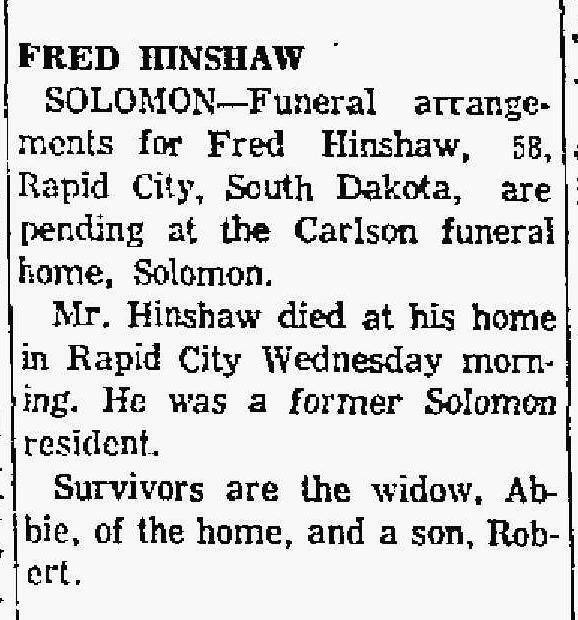 Fred's death was reported in the "Salina Journal" (Salina, Kansas) on Thursday, December 14 19675 (see scan below). Contribution from Robert Keith Hinshaw. 1920 census, Maguire Township, Tillman County, Oklahoma; roll T625-1489, ED 178, page 8A, line #42, dwelling #156, family #169. 1930 census, Hunter Township, Tillman County, Oklahoma; roll T626-1932, ED 16, page 4A, line #1, dwelling #58, family #64. 1910 census, Maguire Township, Tillman County, Oklahoma; roll T624-1275, ED 252, page 6B, line #57, dwelling #100, family #102. "Salina Journal" (Salina, Kansas), Dec 14 1967; http://www.ancestry.com.